Baby’s First Year Pictures. 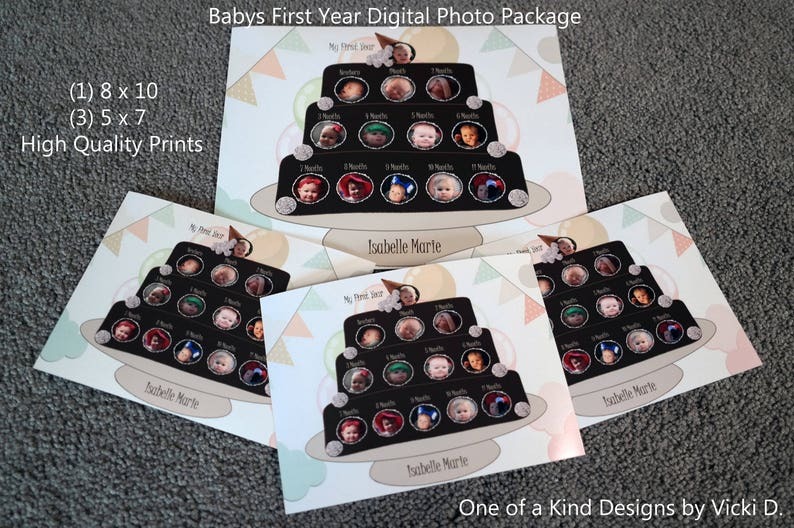 We will digitally place your 12 month baby pictures onto our unique designs. Share first year memories with grandparents & family! Professionally printed digital photograph packages with or without frame option. These are one of a kind designs created by Vicki D. Sold exclusively by Absolute Inspirations and select specialty gift shops across the Eastern USA. If you want a special keepsake of your baby’s first year photos, this is it! No more fussing with picture sizes and placement of your photos. We do all of that work for you digitally and best of all we offer the most unique picture designs around with name personalization. This Standard Family Package shown in the picture comes with (1) 8 x 10 professional print and (3) 5 x 7 professional prints. Mom and Dad can have the 8 x 10 and the 5 x 7 prints can go to grandparents, great grandparents, aunts, uncles or other family members. We offer additional print option packages. YES - we offer gift certificates! This means you can give this unique digital photo gift package as a BABY SHOWER gift or a gift to the new parents. All the recipient has to do is call us at 302 892 2572 when they are ready for our design team to create their baby’s keepsake first year photo gift. They may also contact us by email. All of this information along with an example of the gift they are receiving will be provided upon placement of your order. We will send the certificate and other information via USPS priority mail. If you would like a gift certificate please call us at 302 892 2572 and we will work with you by phone to take your order and gather details on the recipient. The process is simply, once you place your order we will contact you by phone, email or through Etsy conversation so that we can begin to gather your jpeg photos and the spelling of your baby's name as you would like it to appear on the cake plate . Standard practice if for us to receive the jpeg pictures by email at absoluteinspirations [!at] gmail.com. PLEASE NOTE: You will need to identify the photograph, for example if the photo is for the newborn spot please indicate this within the email subject line. Once we have received all of your photos and created your proof it will be sent to your for a final review to ensure we have your babies photos placed into the correct time period, i.e., newborn, 1 month, 2 month, 1 year and so on.